Order within 71 hours and 16 minutes to receive your order by Tuesday 23rd April. 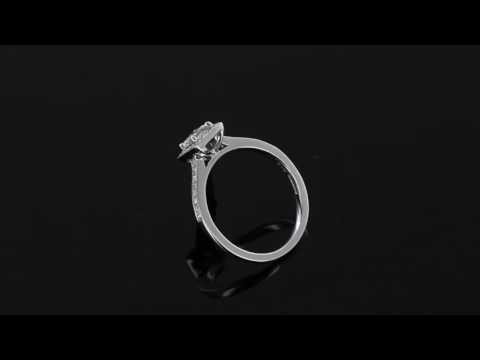 This is a beautiful white gold brilliant and princess cut diamond cluster ring, one that not only has a lot of vivacity but is fashioned from 18 carat white gold. The flawless centre diamond is surrounded by a 7mm halo setting of smaller brilliant cut diamonds. The setting is showcased by beautiful 0.18 carat diamond embellished shoulders. Catching a glimpse of this diamond ring in the light is truly striking, it's high quality colour and clarity make this ring all the more breathtaking to the naked eye. This diamond ring is an elegant piece and comes in ring size M, this ring can be altered please state ring size when ordering.